Central Ave. on Belle Isle, Detroit, around 1905. I just returned from a relaxing trip on a beautiful island get-a-way, a place where I felt transported back in time. This rock featured two gorgeous yacht clubs, a nine-hole golf course, a swimming beach, lots of hiking trails, an aquarium, a conservatory, formal gardens, ball fields, handball and tennis courts, an old lighthouse, lagoons, woods populated with white-tailed deer, and many picnic areas. The numerous historical buildings that dot the landscape are some of the finest on the continent. And the best part? I only had to travel less than a mile from Windsor to Belle Isle. Few cities have anything this impressive: an island park two-and-a-half miles long, accessible by a bridge that would not be out of place in Europe, and only a ten minute drive from downtown Detroit. Known as Wah-na-be-zee (Swan Island) to the Chippewa and Ottawa Native American tribes, the island became popular with early settlers for hunting, fishing bathing and picnicking. Ownership passed over time to the French, then the British, before ending up with American settlers. The city of Detroit acquired the island, whose name changed from Hog Island to Belle Isle in 1879. Soon citizens were calling on the city to create a public space on Belle Isle that would imitate the parks and tree-lined boulevards of Paris. In 1883, the city secured the services of Frederick Law Olmsted, the prominent landscape architect and planner responsible for famous urban parks in New York, Chicago, San Francisco, and Boston. 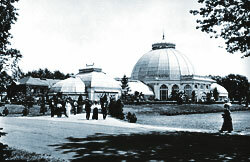 After Olmsted’s design was completed, buildings were added to the island. Olmstead laid out a central road with canals crisscrossing the island. Once heavily forested and marshy, the island soon was populated with a scattering of buildings begun in the late nineteenth century through the early 20th century, most located on the western half of the island. The Horticulture building, also called the Conservatory, includes a fernery and a tropical plants sections, and is surrounded by three acres of formal gardens, lily ponds and greenhouses, was patterned after Thomas Jefferson’s Monticello. The Belle Isle Casino built in 1907, was once said to be the finest casino in the United States. Ornate towers frame the building’s four corners, and verandas provide picnickers with shelter (casino in those days were less about gambling and more about a site for public entertainment. Another fine building is the cottage style police station, which would not look out of place in the British countryside. The 85-foot high Nancy Brown Peace Carillon Tower was dedicated at the 7th annual sunrise service held June 17, 1940. Nancy Brown was one of the first advice columnists in the United States. Her advice column, “Experience,” launched in April of 1919. She worked for “The Detroit News” until her retirement in 1942. Column readers raised most of the building’s funds for this monument. Originally, bronze bells would serenade island visitors with performances. Now, a computer automated 49-bell carillon recreates the sounds of cast bronze bells ringing out. Was it his last and greatest joke? That was the burning question all over town when Detroit's most eccentric bachelor, James Scott, died at 79 on March 5, l9l0, bequeathing his $500,000 estate to the city to build a fountain on Belle Isle. He was a loafer and a gambler; he told off-color stories. And he perpetrated vindictive practical jokes. "Scott's Folly" was one. When the owner of an adjoining lot refused to sell Scott some land that he wanted to add to his property at Park and Peterboro, Scott spent $20,000 to build a sham house. From the Peterboro side it looked like a mansion, but its elegant facade was attached to a high, windowless wall, whose only purpose was to shut out light from the home of the recalcitrant neighbour. 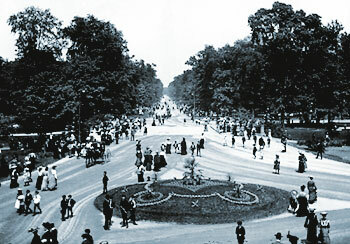 Scott’s fountain on Belle Isle took more than l5 years to build, and was dedicated in 1925. Cass Gilbert won a competition for design of the glistening white memorial. If the fountain was Scott’s last joke, time has made the jest a kindly one. The old Belle Isle Bridge, which burned in April 1915, had a swing section, which opened at midnight, preventing anyone on the island from reaching the mainland until the next morning. To be trapped on the island was tantamount to disgrace and social ostracism. All club dances ended promptly at 11:30. Long after the present bridge opened in 1923, dances at the Boat Club and Detroit Yacht Club continued to end at 11:30. A temporary bridge was built and used until 1923 when the 2,193 foot bridge was completed. In 1953 the present bridge was christened the Douglas MacArthur Bridge to honor General MacArthur who gained fame during World War II and the Korean War. The Walkerville ferry (1881-1942) had a dock at the tip of the island near Hiram Walker’s empire and folks from Windsor would cruise to the island to stroll the grounds or spend the day at Edgewater Park (see Issue #36). 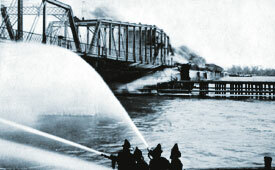 Detroit fireman battle the blaze from boats below the bridge span. Photo courtesy of the Tim Baxter Post Card Collection. Today, however, few Windsorites tour the island, probably because the island’s current state is so depressing. Visitors pass boarded-up buildings, drive over deteriorating roads (wait, it’s just like being in Windsor!) see neglected athletic fields and trash overflowing the once tidy canals. Park advocates argue that the 120-year-old island park could play a huge role in the city’s revival efforts and become a magnet for suburbanites and tourists. If Belle Isle were cleaned up and modernized, boosters say, it could become the glittering centerpiece of Detroit’s riverfront, as much of a lure as Grant Park is in Chicago or Central Park is in New York. The fixes won’t be cheap. Some $180 million is needed in park improvements, according to a group commissioned to develop a master plan for the park. 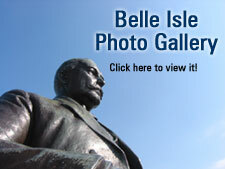 But for those who wish to take a trip back in time, Belle Isle can be a delightful place to unwind. Just don’t go at night on weekends.